New Right leaders Bennett and Shaked say US report is opportunity to apply sovereignty to most of Judea and Samaria. The New Right party announced Wednesday that it will submit a bill to apply Israeli law to Area C in the first week of the 21st Knesset following the publication of a report by the US State Department in which it did not refer to 'occupied territories' in its section on Israel. New Right leader Naftali Bennett said that "the US decision is historic." "Now that the United States no longer sees Judea and Samaria as an occupied territory, there is no reason to wait any longer. Half a million Israelis have to stop being second-class citizens. In Ariel, Ma'aleh Adumim and Ofra Jewish citizens discriminated against because they chose to settle the land. 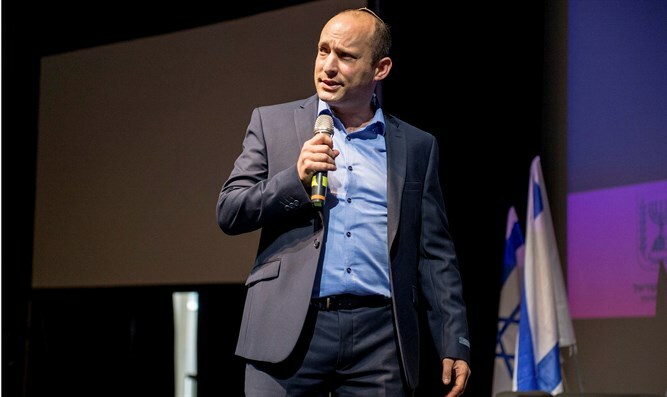 I would like to thank President Trump for the tremendous change in the administration's position, it is a correct step in the right direction," Bennett said. Justice Minister Ayelet Shaked added, "It is time to apply sovereignty in Area C. The declaration of the United States obliges the State of Israel to make bold and courageous decisions that will help Israel's security and full equality of rights for all its citizens."